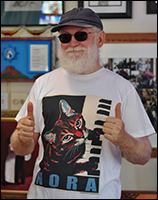 National Music Festival at Washington College is pleased to announce that Nora the Piano Cat has now become its official mascot. Festival Artistic Director Richard Rosenberg conducted the U.S. premiere of the “CATcerto,” written for Nora and orchestra by Lithuanian composer Mindaugas Piečaitis, in 2010 in Hot Springs, Arkansas. The piece has been performed multiple times throughout the U.S. since then. Last year at the National Music Festival, Rosenberg conducted it again, this time with Betsy Alexander and Burnell Yow!, Nora’s personal assistants, in the audience. It was their first time hearing it live. Patton and Rosenberg had the privilege of meeting Nora, Alexander and Yow!, and Mindaugas Piecaitis in August 2010. 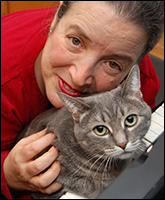 Nora was adopted nine years ago by piano teacher and composer Betsy Alexander, and artist Burnell Yow!. Alexander noticed Nora’s interest in the grand piano in the living room. After watching piano students play for a year, Nora decided to play a couple of notes on the shiny grand piano. Since then, she hasn’t stopped. She first caught the attention of Alexander’s students, who began bringing their friends to hear her play the piano. When Betsy wanted to show her niece in Wyoming a video of Nora playing the piano, her students suggested posting the video on YouTube so her niece could see it. Alexander had never even heard of YouTube. 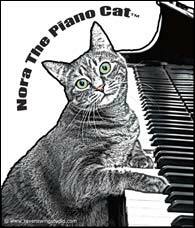 The day the video of Nora tickling the ivories went public, it garnered seventy-two views. Within just a few weeks, it had gone viral and Nora became a YouTube sensation with a combined thirty-seven million viewings to date. She now has tens of thousands of adoring fans from all over the planet. “We are excited to have this chance to work with Nora,” Patton says. “It opens a whole world of opportunities to help both of us achieve our goals.” Nora and the National Music Festival plan to sponsor a musical composition competition in the upcoming years for composers of all ages. Designs for NMF and Nora merchandise are in the works and will be ready for sale soon. The National Music Festival at Washington College is a 501(c)3 non-profit organization devoted to bringing classical music to a wide audience and providing full scholarships to the young musicians on the cusp of their professional careers, who attend as apprentices. The Festival can only thrive on the generous contributions individuals as well as businesses. For more information about the Festival, visit www.nationalmusic.us, e-mail info@nationalmusic.us or call (410) 778-2064. Click here to download the PDF of the Press Release. Concatulations, Nora! This is great news! Hi sweet Nora, congratulations, you are a great star, hugs and love to you from Mary and Michita the kitty! Congrats Nora! I was beginning to wonder if you retired. Haven’t seen any posts on Facebook in ages. What a great honor, so happy for you. I do like this news! congratulations Nora,Betsy and Burnell! I know what it is and how it feels to be in the concerthall to see and hear you playing LIVE! With Mindaugas next to me! Bye,bye! Yay, Nora, way to go! You are so cute!